Freezing rain fell in Philadelphia and the north and west suburbs overnight while snow fell until turning to ice in the Poconos and Lehigh Valley. It’s all part of a second storm this week that continues to move through our region, creating slippery road conditions throughout. Basically if you don’t have to go anywhere, don’t. Driving conditions are bad in many areas and trees are blocking some roads. Of course, you might be sitting in the dark. 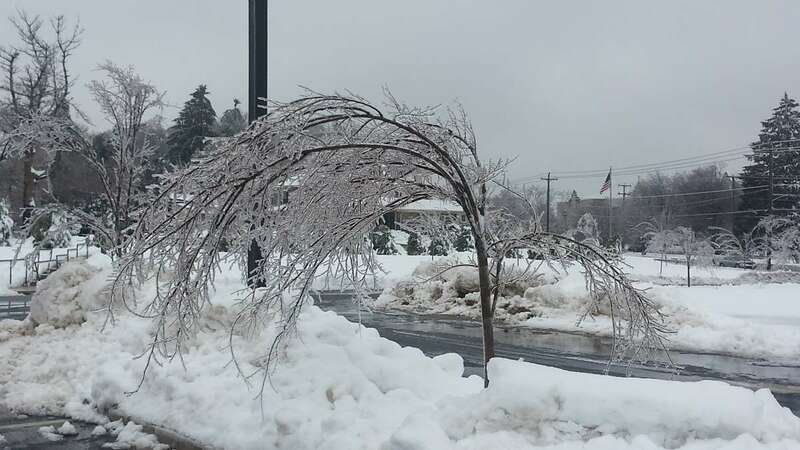 The icy conditions knocked out power to more than half a million customers — nearly 80 percent of PECO customers in Chester County and nearly half of PECO’s Montgomery County customers — around the region as ice weighted down power lines and caused branches to break. See PECO’s map of service outages. Nearly1/3 of an inch of ice had fallen by 7 a.m. in Northeast Philadelphia and Trenton, N.J. with more than 1/4 inch in Norristown; Pottstown, Pa. and Washington Township, N.J.
Abington Memorial Hospital was using on backup generators after power was knocked out to the area. 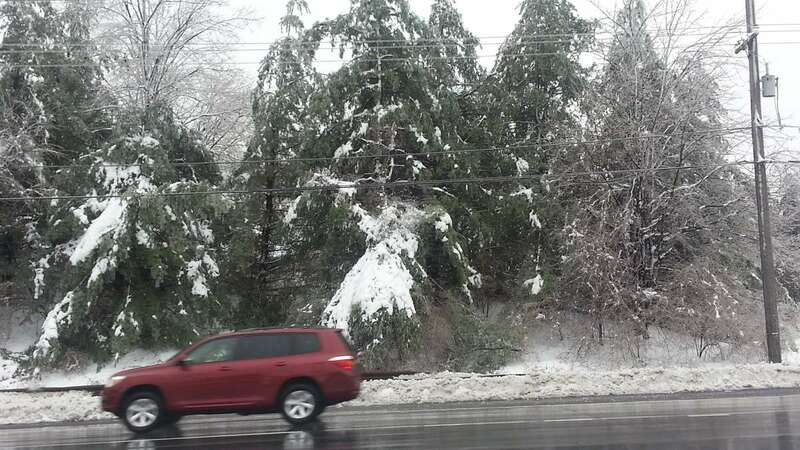 The icy mess caused wrecks around the region including crashes and downed trees on the Schuylkill Expressway (I-76), Route 30, the Pa. Turnpike and a tree that sprawled across U.S. Route 1 northbound at Maple Avenue in Bucks County. PennDOT closed I-76 eastbound at the Blue Route (I-476) due to concerns above downed trees and closed U.S. Route 1 between I-95 and Route 213 due to a downed trees. The Pa. Turnpike also warned of downed tress in the lanes of the Pa. Turnpike’s Northeast Extension and closed the road in both directions from Exit 236 to Exit 242. Plenty of local roads were blocked by trees and, with power knocking out traffic signals, drivers should treat those intersections as four-way stops. It wasn’t much better on the rails. 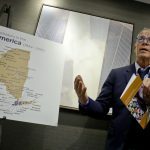 Amtrak suspended service between Philly and Harrisburg around 9 a.m.
Service was suspended along SEPTA’s West Trenton Line and New Jersey Transit’s Northeast Corridor due to wire problems on Amtrak’s line that knocked out service for hours. SEPTA also said the Cynwyd, Paoli/Thorndale and Warminster Lines were suspended. They said to expect delays up to 30 to 40 minutes on some rail lines, trolleys and a handful of bus routes due to power issues. SEPTA said to track delays and cancellations on the SEPTA website but the site slowed to a snail’s pace due to increased traffic. SEPTA spokeswoman Heather Redfern said the site isn’t actually down but slowed. 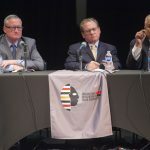 She said SEPTA’s IT team was addressing the problem. The storm also closed area business and government offices including the Philadelphia Zoo and Montgomery County’s government. The power outage also forced the Montgomery Mall to close until further notice. A Winter Storm Warning is in effect for the entire state of Pennsylvania as well as parts of South Jersey and Delaware until 1 p.m. Wednesday. By the time the storm moves out, forecasters say some parts of the area could get up to a half-inch of ice. Bill also says that conditions should slowly improve as time passes. “We will see slow improvement during the morning,” he said. He also advised drivers to be careful, especially in the north and west suburbs. Due to slippery road conditions, officials with the Pennsylvania Turnpike banned commercial vehicles pulling double trailers as well as empty tractor-trailers throughout the Turnpike system until further notice. All tractor-trailers are restricted to the right lane only between the Breezewood and New Stanton exits. Officials also reduced speed limits on the Turnpike to 45 mph for roadways for hours before lifting the restriction after 9 a.m. Drivers were warned to stay alert for areas with snow, poor visibility and icy road conditions. 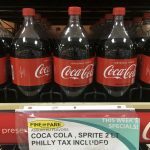 They were also advised to allow plenty of space when driving near plow trucks and to never attempt to pass a truck while it’s plowing or spreading winter materials. 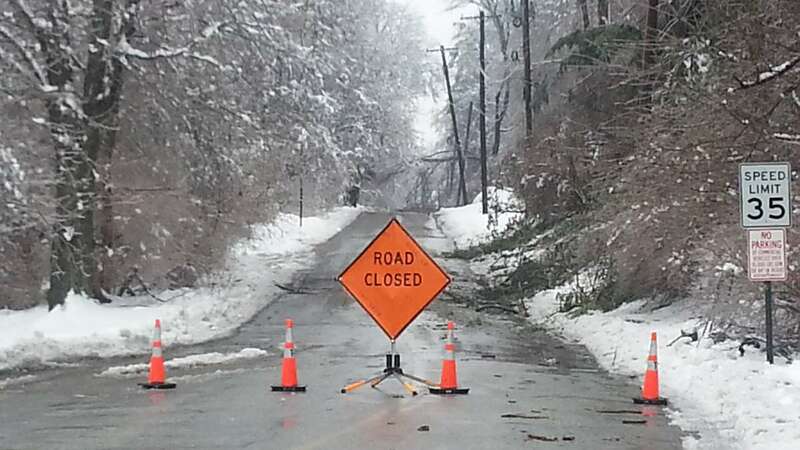 In Lower Merion Township motorists were warned to stay off the road due to downed trees, power outages and slippery streets. It also knocked out phone service to the Horsham Township Building and police station. A small amount of ice can make walking and driving tricky, but higher amounts can wreak havoc on trees and power lines. A half-inch accumulation of ice on power lines can add 500-pounds of extra weight, according to our sister network The Weather Channel. Ice can also increase the weight of branches by 30 times significantly increasing the potential for breaking and complete falls. “Remember, respect the snow, fear the ice,” said Gary Szatkowski, of the National Weather Service’s Philadelphia/Mt. Holly Office. Snow is still falling in the Upper Lehigh Valley and the Poconos. Nearly 8 inches fell in Tobyhanna in the Poconos..
Allentown, Easton and most of the northern and western Pa. suburbs — 9 inches fell in Bushkill Township — got measurable snow before turning over to ice. Philadelphia, the I-95 corridor and the nearby suburbs didn’t see much snow but did get plenty of ice. Only rain fell in most of far South Jersey and Delaware. The storm is expected to move out early this afternoon. After storm No. 2 moves out, a third system will move into the area over the weekend with the potential for more winter weather. Glenn says the track of that storm will be determined by what the second storm does.